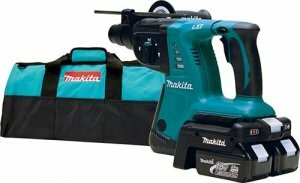 Back when Makita first announced their 36V rotary hammer 3 years ago I wondered why they just didn't make the tool run on two 18v batteries. I am sure they had their reasons, and maybe they expected to have more 36v tools out by now, but the 18v line is super popular and it just makes sense to have a tool that runs on the most popular battery. 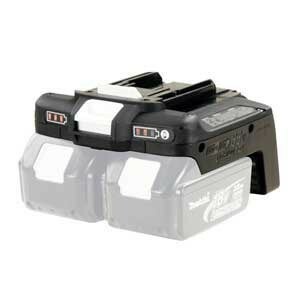 Despite the ability to use 18v batteries, the HRH01ZX2 is not a completely new tool. The tool is actually the same HRH01 I wrote about two months ago with the addition of a 2x 18v to 36v converter. At some point I suspect Makita might even offer the (BCV02) 18v to 36v converter as an accessory for other 36V tools. I am hoping with the addition of this adapter Makita will develop more cordless tools that can benefit from the increased power. And they should also make a 2x battery charger. Say goodbye to the cord, and forget about separate batteries and chargers. Makita 18V X2 LXT® delivers 36V power with two 18V Lithium-Ion batteries, so you get the power and run-time for corded demands without leaving the 18V LXT® Lithium-Ion battery platform.